Drama; 1992; 173 minutes; Color. Available from Amazon.com. 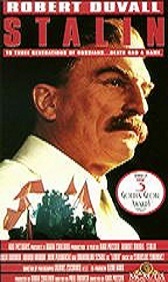 This movie focuses on the manner in which Stalin rose to power and his relations with his family. It is told from the point of view of his daughter who serves as the narrator. Selected Awards: 1993 Golden Globe Awards for Mini-Series or Motion Pictures Made for Television: Best Actor (Duvall); Best Supporting Actor (Schell); Best Supporting Actress (Plowright); 1993 Golden Globe Awards Nominations: Best Mini-Series or Motion Picture Made for Television. Featured Actors: Robert Duvall, Julia Ormond, Jeroen Krabbe, Joan Plowright, Maximillan Schell, Frank Finlay, Roshan Seth, Daniel Massey, Miriam Margolyes, Jim Carter, Joanna Roth, Andras Balint. “Stalin” will give children some understanding of one of the major figures of the 20th century and of the men who created the Soviet Union, including Lenin and Trotsky. MINOR. Many murders and several beatings are shown but there is little graphic violence. Usually, the camera pans away and you hear the gunshot. Alcohol use and abuse and smoking are shown. This movie is best if watched in tandem with The Inner Circle, an examination of the love for Stalin felt by a Russian “Everyman”. If your child is not familiar with Stalin talk to them about this important leader/mass murderer of the 20th century. See the Helpful Background Section for the Learning Guide to “The Inner Circle“. Then ask and help your child to answer the Quick Discussion Questions in the Learning Guide to “The Inner Circle“. See Learning Guide to The Inner Circle. Joseph Stalin (1879-1953) was the dictator of the Soviet Union from 1924 until his death. He was born a village shoemaker’s son and studied for the priesthood. He joined the Bolshevik Party in 1912 and was elected to the Communist Party Central Committee in 1917. In 1922, he was elected general secretary of the Russian Communist Party and used this position to gain power. After Lenin’s death, through intrigue and murder, Stalin eliminated any threat to his rule. In 1928, he began an industrialization program and collectivized agriculture. He also sought to “Russianize” the Soviet Union, eradicating by force separate minority identities. Any dissent was crushed by powerful secret police using informers, mass deportations, show trials, and summary executions. In 1935, Stalin began a “purge” of the army and the party. The purges continued through Stalin’s death. Tens of millions of Soviet citizens died as a result of Stalin’s policies. For example, in Ukraine, the “breadbasket” of the Soviet Union, he starved millions of peasants to death by taking virtually all of their grain and selling it to buy foreign machinery with which to launch his industrialization campaign. Stalin was responsible for the deaths of more of his countrymen than the number of people that Adolf Hitler killed in the concentration camps. Stalin and Hitler partitioned Poland between Russia and Germany. Stalin ordered the invasion of Finland in 1939 and imposed Communist rule on the Baltic States of Latvia, Estonia, and Lithuania in 1940. Stalin was unprepared for Hitler’s invasion of Russia in 1941. The Russian will resist, the use of scorched earth tactics, one of the coldest winters in history, and massive aid from the United States helped the Russians to defeat the Germans on the Eastern Front. After WWII, the Russians controlled Eastern Europe and imposed Communist rule. Stalin pursued a cold war policy that fostered rapid industrial recovery at home. Within three years after Stalin’s death, the new dictator of the Soviet Union, Nikita Khrushchev, launched a “de-Stalinization” program attacking Stalinist terror, debunking the Stalinist personality cult, and exposing Stalin’s crimes. Leon Trotsky (1879-1940) was one of Lenin’s chief lieutenants and led the Bolshevik seizure of power in the October 1917 Russian Revolution. He organized the Red Army into an effective fighting force. After Lenin’s death, Stalin forced Trotsky to leave Russia. Exiled in Mexico, Trotsky continued to attack Stalinism until he was assassinated in 1940 by a Soviet agent. Vladimir Ilyich-Lenin (1879-1924) was the founder of the Bolshevik Party later called the Communist Party and leader of the Bolshevik Revolution in 1917. He founded the Union of Soviet Socialist Republics (U.S.S.R). Lenin applied Communist theory to Russia’s undeveloped economy. Before his death, Lenin warned against Stalin’s growing power but Stalin was able to suppress this warning. This movie shows Stalin as disliking Jews. There is a tradition of anti-Semitism among Russian rulers and among its people. See Fiddler on the Roof. Given Stalin’s bloody history, the Jews were fortunate that Stalin did not engage in wholesale genocide as did Hitler. Who killed more people, Hitler or Stalin? It’s hard to tell. By launching World War II, Hitler caused the deaths of well over twenty-five million people. He is also charged with the murder of an additional twelve million people in the concentration camps. But Stalin killed tens of millions as well. For example, in Ukraine, the “breadbasket” of the Soviet Union, he starved millions of peasants to death by taking virtually all of their grain and selling it to buy foreign machinery with which to launch his industrialization campaign. 2. What were some of the differences and some of the similarities between Nazi Germany and Communist Russia? See also Discussion Questions to The Inner Circle. 1. Why did Stalin kill his associates and allies as well as his enemies? 2. Do you think that Russia needed Stalin or someone like him to emerge as a world power? Defend your answer. 3. Ambition is usually a good thing. But what are some of its risks? 1. Taking the position as leader of a country imposes a special responsibility on a person. Do you think that Stalin fulfilled these responsibilities? 2. Do Stalin’s actions meet the test of The Golden Rule, i.e., would Stalin have wanted to be treated in the same way as he treated others? Assignments, Projects, and Activities for Use With Any Film that is a Work of Fiction. Proletariat, purge, Bolshevik, Old bolsheviks, anti-Semitism.